This Healthy Green Smoothie recipe tastes like dessert. I promise that you won't even be able to taste the spinach in it, because it is so full of delicious fruity flavor. It is so easy to make and comes together in minutes. 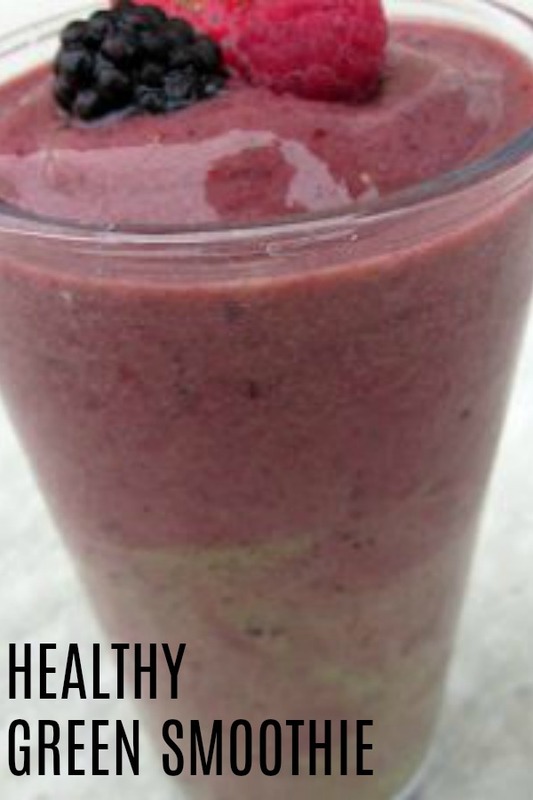 You will love this healthy smoothie recipe. I never thought I could be someone who drinks a smoothie full of spinach but my sister, Kristen, gave me this recipe for a delicious and nutritious green smoothie. The best part is, you don’t even notice the spinach because it isn’t bright green. This smoothie only has 200 calories. It is actually very sweet tasting. It’s also my new go to after the gym each morning. It tastes so refreshing and only requires a few simple ingredients. You are going to love how easy and delicious it is. I highly recommend this smoothie. And just a few months ago, I would have never thought to make it, let alone try it. But I promise, healthy eating has never tasted so yummy. It’s great for a healthy snack, or a delicious breakfast. -Add a scoop of peanut butter or peanut butter powder. We love adding a little protein to our smoothies, and it is such a simple way to get it into your diet. Everyone loves a good smoothie, but it’s even better when you can sneak in the good stuff, and not even taste it. The smell is also amazing as it bakes. A healthy green smoothie that is nutritious and delicious! Add all ingredients to blender and blend until smooth. Add water to reach desired consistency. oh how I love the green smoothies! I had one of these this morning, same ingredients you cannot taste the spinach whatsoever, it's absolutely delicious. Do you use frozen spinach or fresh spinach? I have only used fresh spinach! Thanks! This looks great! I have been trying to make green smothies, but it has been hard for me to get the spinach to completely blend in... doing it first with the juice is a great tip.. thanks for sharing! And thanks for hosting your party! I was so excited when I saw this post! I've been making just fruit smoothies but have wanted to figure out a way to add veggies. I'm always trying to figure out a way to add veggies to my son's diet, so I think this may just work! Just curious, What's the benefit of adding spinach? Does it lower the calories? And the list goes on and on 22 vitamins in all. i use spinach, a bit of yogurt, whatever fruit is in the fridge or freezer, sometimes broccoli too. also add whey protein sometimes....delicious! i have found it helps to vary the yogurt, and it helps to change up the taste/texture. greek yogurt is also delectable! You can also use other juices to vary the flavors. 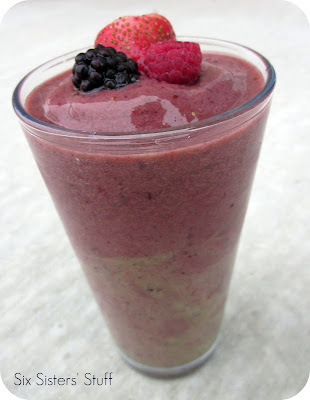 I have used acai blends, strawberry banana juice, and berry juices. Make sure their 100% juices only. And yes, add yogurt too. Spinach is a great source of protein too! A version of this is old fashion oats, spinach leaves fresh, soy milk or Apple juice and a scoop of vanilla protein powder for a protein shake. Super yummy and tastes like vanilla oatmeal. Oh and non fat yougurt too! I blend fresh spinach with a little bit of water and pour into Ice cube trays or mini muffin pans. Once frozen just pop them into a freezer bag. You can easily freeze fresh spinach. That would be better than the frozen chopped spinach. The banana covers the flavor of the spinach. But I know lots of people that eat it without adding bananas. Add a little more fruit and try it! Let us know how it goes! spinach "fresh" in a smoothie doesn't have a flavor. I make smoothies similar to this all the time. Omit the juice for water and it'll be less calories. Use baby kale instead of spinach or do half and half until you work up to it. You get used to it. I make mine with unsweetened coconut milk instead of apple juice (which is just empty calories). I use kale also. It barely has any flavor as it is, so in a smoothie, it's perfect, especially if you don't like to eat veggies otherwise. I make mine with unsweetened almond milk. You are so right! The best way to start drinking "green" smoothies is to drink/serve one that isn't green. This smoothie has such a beautiful color and I can't wait to serve this to my veggie sensitive hubby. Simply beautiful!